Today we will discuss about which database user can be used at Data Server (Topology) and why. As usual, Oracle database will be used in the example. 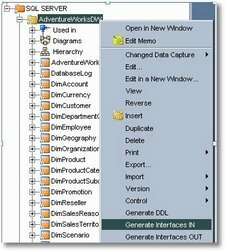 When you start with ODI, one of the firsts things to learn is that is necessary configure database connections to reverse the source and target table. And what every single beginner does? 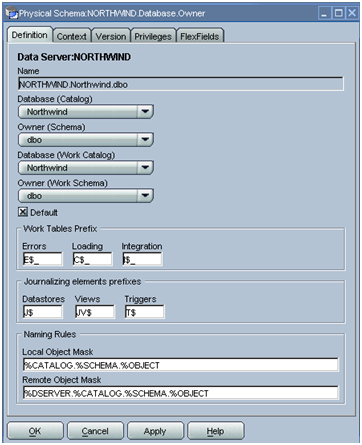 Configures both Data Servers (source and target) using the owner schema of the source and target tables and, after that in the ODI physical schema, choose the same schema as “Data Schema” and “Work Schema”. This is a natural behavior once he is a beginner but let us make a simple analysis about what was done from Database point of view. 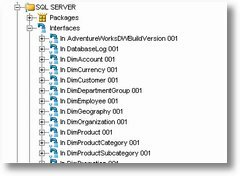 Developers from other softwares than ODI starts to see ODI tables and could interferer in its working dropping a I$ table that “shouldn’t” be there once it doesn’t belongs to the original schema. at 2:15 PM there is no tablespace to the database works. Then what do to avoid all of this problems (and a few more not discussed…)??? The solution is very simple and the same as always… CREATE A USER JUST FOR ODI! And make it as your Staging Area (Work Schema at Physical Schema). Total security control once it will be necessary to grant access to any table that needs to be read or updated or selected, etc. 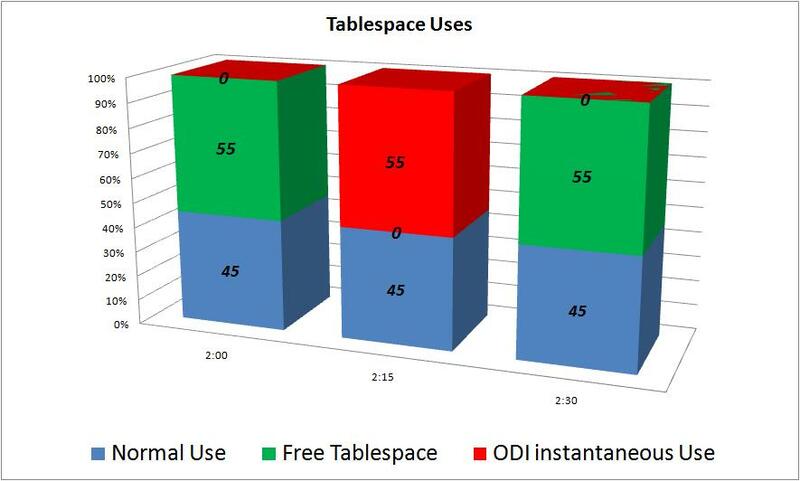 Less ODI objects once only one Data Server (Topology) by database will be necessary. These are some advantages between others! Well folks, I hope to have helped in the understanding of a “Best Practice” in ODI Administration. It’s very frequent I got emails asking me how to use PL/SQL function and procedures in ODI. For that, all you need is an Anonymous blocks of PL/SQL. That is all. Voila!!! It’s possible to call a procedure! And yes, I know that I showed the simplest possible case… hehehehehe! 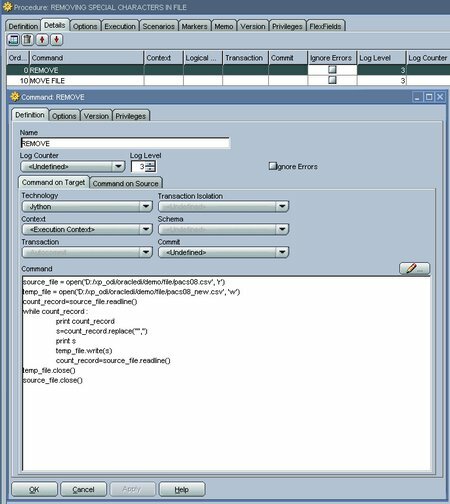 You need to call a generic ERP PL/SQL procedure that has 2 “in” parameters and 1 “out” parameter before starts an interface. This “out” parameter brings if there is a business error. This code will allow you get a business error into Operator and even use the getPrevStepLog API to send an email with the error description. Ok, can we add more complexity??? 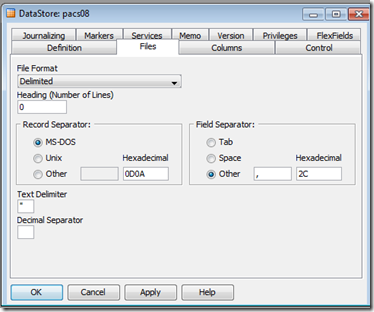 You need to call a generic ERP PL/SQL procedure that has 2 “in” parameters and 1 “out” parameter before starts an interface. This “out” needs to be passed to an ODI variable to future uses. Add the procedure followed for the ODI variable (in Refresh mode) and you will have the ODI variable composed with the “OUT” value from a PL/SQL Procedure. Well my friends, that is all. At true, it isn’t so complicated. Any comment is highly appreciated! It’s very common doubts raises from this combination because it is based in 3 concepts that I call “The three bases”. The most important is: one doesn’t exist without other. 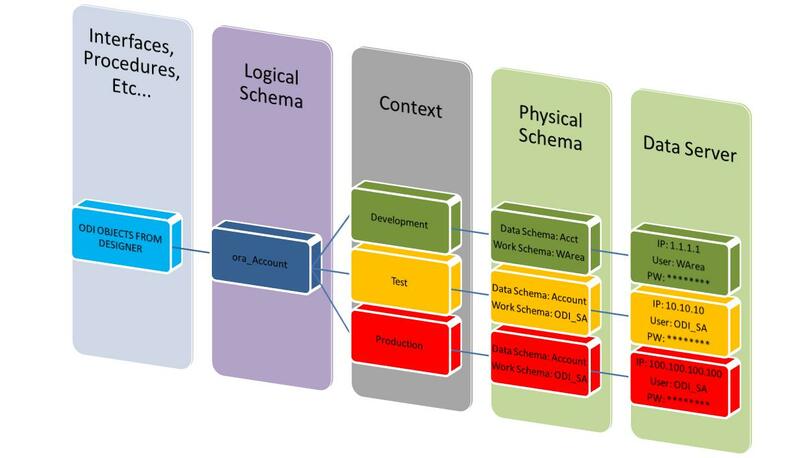 It’s good remember that Data Server can be understood as the higher level of Physical Schema and that one Physical Schema is linked to one, and no more than one Data Server. How does this flow wok? Defines an “environment”, a particular instance for code execution. The most common example is Development, Test and Production environments but there are several possible other possibilities. It is an alias to a “Logic Structure”, I mean, when a code is developed in a Development environment (a single interface in ODI as example) it is expected (and necessary) that any database structure table and column used at it must be at any new environment where this code could be deployed because, if not, a database error will be raised. Logical Schema is the final dot to understand the flow. The idea behind its existence is allow the same code be used at any environment once it is an alias. But this alias, the Logical Schema, can not work alone, once it only represents the a Logical Structure not the connection itself, I mean, User, IP, etc… For that, exists the Physical Schema. It will complete the Logical Schema with physical characteristics to connection. Because of that, one Logical Schema is linked to one, and just one, Physical Schema. But why to have an alias to the user, IP, password??? Because then there is no need to include these physicals characteristics into the scenario (“compiled code”) allowing that if, for instance, a password is changed there is no need of a scenario regeneration!!! Well, after understand the link between Physical and Logical Schema how to add the Context in this equation? 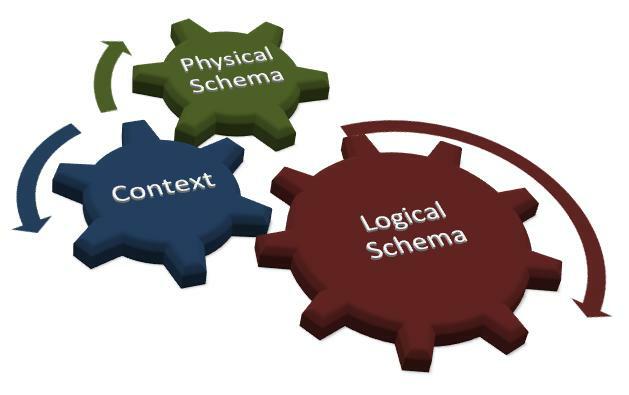 It is to determine, at execution moment, to which hardware the Logical Schema that points to a Physical schema it will be executed. A hardware here can be understood as Development, Test or Production. If you take a look into the users and schema’s used at the figure you will see differences between the environments. I will explain those differences in another post, about “Connection Architecture”. Friends, I hope to be helpful in the understanding of all this concepts! I got a lot of emails asking me what is the difference between Development Work Repository (DWR) and Execution Work Repository (EWR) and too, why and when use each one. In this post, I will try to explain these questions. First we are discuss the concept of each type of repository and, after, the inter-relationship between them. What is a work repository from ODI point of view? In this way, the ODI client install is only for GUI (Graphical User Interface) and then if, for instance, a HD from a ODI developer hardware crash, since the database wasn’t at same HD, absolutely nothing is lost. Development Work Repository (DWR) – The code storage. In my concept of a perfect ODI environment it’s where the unitary tests are executed, I mean the tests, from developers, after finish the development of an object. Execution Work Repository (EWR) – The “compiled code” (scenario) storage. It means, after a generic development be ready to go to test (or production) and a scenario is generated from it (“compiled code” from ODI concept) it should be imported into a EWR for integrated tests (once again in my concept of a perfect ODI environment). OK, after define each repository, let me try to show how to use each one. In theory, any program code, doesn’t matter if ODI, Java, Visual Basic, PL/SQL, should have just one version in production and just one code to be altered. Of course there is exceptions, when a “bug fixer” is necessary for some old version but this is more frequent in softwares, not at single programs or process. The Operator see some other small problem and, too, take the decision to fix it. Now, the Business Analyst ask for a new mapping and the developer executes it. Think… In wich code the new Business Analyst request will be implemented? Can anyone assure that the same process will be tested for the same “tester” and he will remember the process and fix the old issue once more? Of course that I’m creating limit situation but is to build a terrible scenario and scare you, for sure!!! Worse than that, imagine if someone put a malicious code in production once can access it with the Developer module? I know that controls can be created to try to avoid these situation but I prefer doesn’t create a door if no one can pass thru it. There is no reason to create it. Well, these are my reasons to defend a Work Repository Architecture with just one Development Work Repository and so many Executions Work Repositories as your environment asked for! To remove such special character from ODI without running Unix script or other scripts , Please follow this simple ODI procedure to remove such special character using Jython script. Finally after the complete tranfere i move the temp file to source so that we dont need to make any changes to the source. 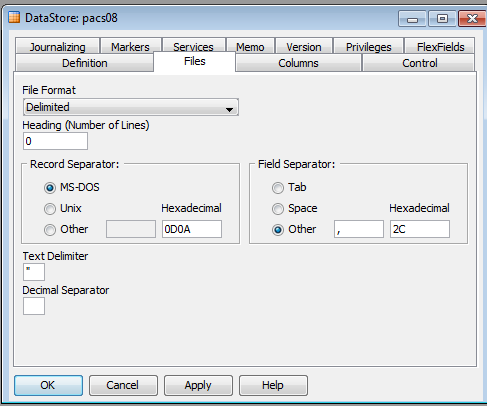 Under the required data store – in Text Delimiter provide the Special Character and the special character will be suppressed while loading into the target .As for my example i have provide the semicolon in the Text Delimiter. The File is still there with the special character but this is the easiest solution. Define your Model Folder and Models . 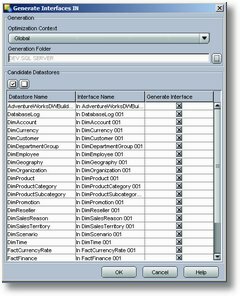 Select your Generation Folder and Optimization Context accordingly and Select the Data Store Name for which the interfaces needs to be generated else Click ok and all the Interfaces will be generated at selected Folder. 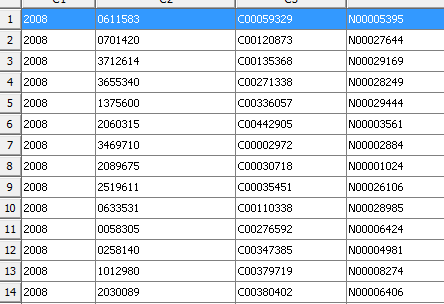 The sample Interfaces are generated as shown below according to the desired Data store Name. Drag in your source and apply the LKM , IKM and CKM and run the interface. Now there is simple process to make the selection of the KMs automatically. 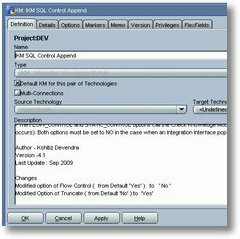 Source – SQL Server and Target – Oracle , LKM as SQL to Oracle , IKM SQL Control Append with No Flow control and Truncate as yes for options and No CKM as Flow control is disabled in IKM. Open your LKM – LKM Sql to Oracle – Check mark the option Default KM for this pair of Technologies. Go the CKM Oracle and SQL and uncheck the mart – ” Default KM for this pair of Technologies ” as CKM wont be used since we are disabling the flow control option. Now drag your source and automatically your LKM , IKM and CKM will be selected. If not check with other option KMs , if they are overriding the above mentioned option of “Default KM for this pair of Technologies” . Keep looking at ‘www.odiexperts.com ‘ for more wonderful tips and tricks. This Post defines the simple process on how to setup automatic daily backup of ODI Master and Work Repository. This process is especially important where there is no backup or improper schedule backup is carried out by DBAs. This way Exported Master Repository is saved with Meaningful Filename and Date of the backup. Sample output of the above files. Creating daily such Exports of Repository won’t be an ideal solution, so its good to delete the old archive and keep just two days of archive . To do so , Please follow these simple steps. Here iam using -2 as i want to keep just two days of files and delete all the previous day files.Change this value according to your need. Call ‘ ODIFILEDELETE ‘ to delete the required files. 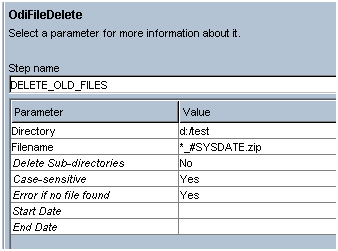 The Filename ‘ *_#SYSDATE.zip ‘ will delete the required day file. so if the sysdate is 23-09-2009 , the above command will delete 21-09-2009 files. This simple procedure would enable you to have a simple backup of the Master and Work Repository especially in condition where there is no proper backup of Development database or backup is not being carried out at proper interval. Schedule the Package using ODI Scheduler and schedule it accordingly and add odisendmail for any success or failure notification. If any error occurred and you are not being able to recover the Database or Repository ,these backup files can come into handy and using the right Import procedure the whole Development box can be brought back to action. Please keep looking into future post of ‘ odiexperts.com ‘ for how to do a proper Import without affecting objects Internal Id . <property>=<value>: Connection properties. Refer to the driver’s documentation for a list of available properties. Now go to the topology and Under the Physical architecture of Microsoft SQL Server. Define a New Data Server with the required Name , User connection. Learn more about option like selectMethod=cursor and responseBuffering=adaptive here http://msdn.microsoft.com/en-us/library/bb879937.aspx and other connection strings here http://msdn.microsoft.com/en-us/library/ms378428.aspx. 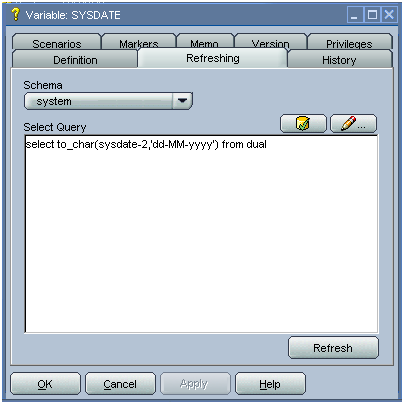 Click Test to test the connection and Select the appropriate database and owner for Physical Schema and define the appropriate Logical Schema. For the Work schema owner , the right user who have permission to access the schema has to be selected. 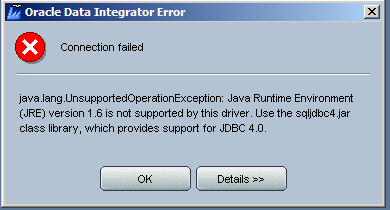 JDBC Driver ver 2.0 works only with JDK or JRE 1.5 or greater and as ODI is shipped with 1.4 so you would surely encounter the error. 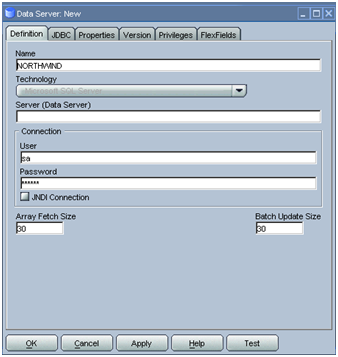 Sql Server JDBC Driver is shipped with both ‘sqljdbc‘ and ‘sqljdbc4‘ .To use JDBC Type 4 driver copy only ‘ sqljdbc4‘ in the ‘ oracledi/drivers ‘ folders . Copy the ‘ sqljdbc4 ‘driver and test the connection. Restart the agent and try the same Driver and URL as shown above and refer to its ‘ Release ‘ document for more details. I got some emails and comments asking for publish about how to work with more then one Master Repository and, you will see, it isn’t so complicated. I will use, as base, the post Repository Architecture – Just one Master – Part 2 to show to have a multiple Master Repositories environment. Question: Why to have 2 or more Masters Repositories? Answer: When there is any restriction, physical or by policy, about contacting between environments, i.e. Development Environment has no physical connection with Production. Very common architecture to financial institutions like banks. ODI works with Logical Objects (Schemes and Agents) to separate the developing from “physical ” changes, I mean, changes of IP, User, Password, hardware, etc. 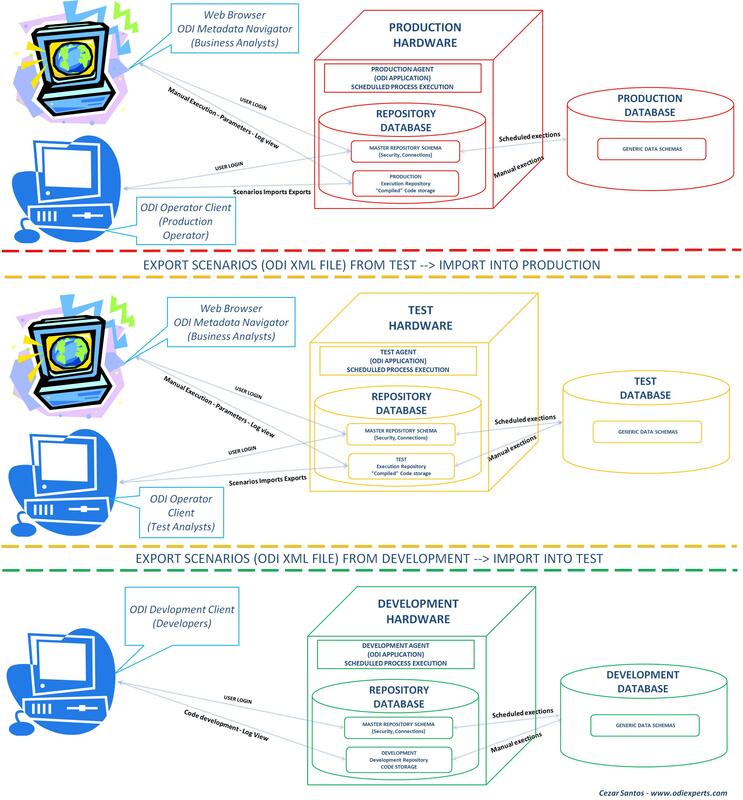 Using this concept, once exactly the same Logical objects are declared (created) in the three environments, it is absolutely possible to migrate scenarios from Development to Test to Production. The connection and agents (physical objects) created at Topology can be, with no problem, created each one in its respective environment with its own parameters once they will be different once each one go to distinct hardware. I mean, no ODI import/export is necessary for physical objects. I hope to have helped you to obtain more knowledge about ODI Repositories.